VISUAL FAITH technique for your Bible or notebook......take one layer of a decorative napkin and trim it to the width of the space for journaling. Using PPA (Perfect Paper Adhesive) from USArtQuest.com, I adhere it to the page, place deli paper on top of it, close the book to let it dry and prevent wrinkling. The deli paper prevents any moisture transferring to the opposite page. A thin coat of PPA is all you need. When it is dry, use stamps, permanent ink, or rub-ons for your journaling. 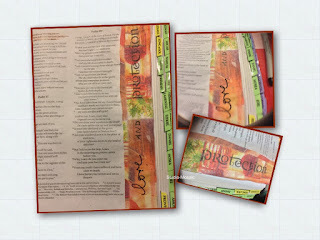 This is a great way to cover the back of a page that has bleed-through from previous journaling. You can do several pages at the same time so they are all ready when you are! Additional tip: Place a small piece of tape on a corner of each side of the tissue to pull the layers apart. I'd enjoy seeing some of your completed pages! We'll be doing a napkin exchange at the August 19th Michigan Visual Faith Retreat at St. John Lutheran Church & School. Bring one, take one, bring two, take two, etc. See event details on FaceBook at Visual Faith Community - Metro Detroit, or in the blog post here.